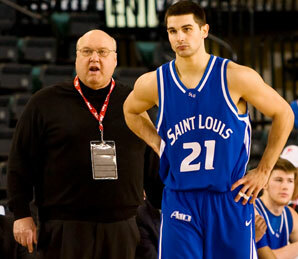 Rick Majerus (L), did not return to coach at Saint Louis University because of an ongoing heart condition. Majerus died Sat. Dec. 1 at the age of 64. Rick Majerus, the jovial college basketball coach who led Utah to the 1998 NCAA finals and most recently coached at Saint Louis University died Saturday. He was 64. The school announced Nov. 19 that Majerus wouldn’t return to Saint Louis as coach because of the heart condition. Majerus was 95-69 in five seasons at Saint Louis and had a 25-year record of 517-216, with 15 20-win seasons and two 30-win seasons. He had his most success at Utah, going 323-95 from 1989-2004. He was at Marquette from 1983-86, and Ball State from 1987-89.